Investing in small cap stocks has historically been a way to outperform the market, as small cap companies typically grow faster on average than the blue chips. That outperformance comes with a price, however, as there are occasional periods of higher volatility. The fourth quarter of 2018 is one of those periods, as the Russell 2000 ETF (IWM) has underperformed the larger S&P 500 ETF (SPY) by nearly 7 percentage points. Given that the funds we track tend to have a disproportionate amount of their portfolios in smaller cap stocks, they have seen some volatility in their portfolios too. Actually their moves are potentially one of the factors that contributed to this volatility. 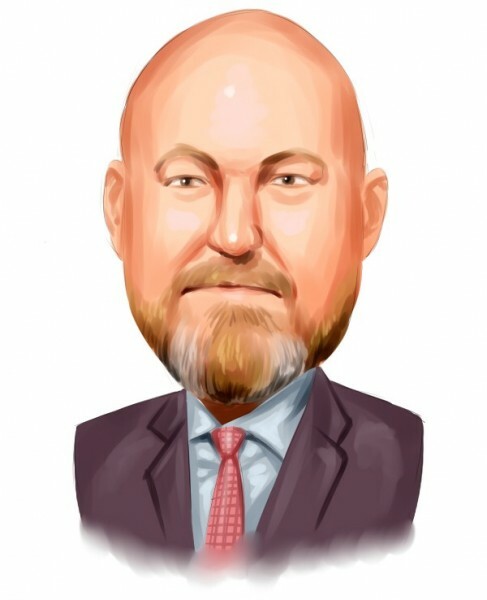 In this article, we use our extensive database of hedge fund holdings to find out what the smart money thinks of NetApp Inc. (NASDAQ:NTAP). NetApp Inc. (NASDAQ:NTAP) was in 21 hedge funds’ portfolios at the end of the fourth quarter of 2018. NTAP has experienced a decrease in enthusiasm from smart money of late. There were 27 hedge funds in our database with NTAP positions at the end of the previous quarter. Our calculations also showed that NTAP isn’t among the 30 most popular stocks among hedge funds. We’re going to view the key hedge fund action regarding NetApp Inc. (NASDAQ:NTAP). How are hedge funds trading NetApp Inc. (NASDAQ:NTAP)? Heading into the first quarter of 2019, a total of 21 of the hedge funds tracked by Insider Monkey were long this stock, a change of -22% from one quarter earlier. 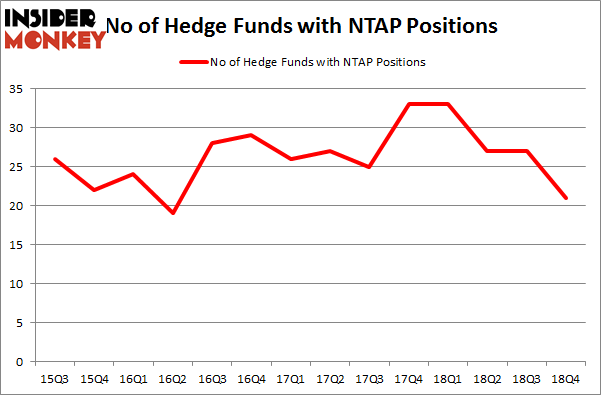 The graph below displays the number of hedge funds with bullish position in NTAP over the last 14 quarters. So, let’s examine which hedge funds were among the top holders of the stock and which hedge funds were making big moves. The largest stake in NetApp Inc. (NASDAQ:NTAP) was held by Renaissance Technologies, which reported holding $380 million worth of stock at the end of September. It was followed by AQR Capital Management with a $71 million position. Other investors bullish on the company included Two Sigma Advisors, GLG Partners, and D E Shaw. Judging by the fact that NetApp Inc. (NASDAQ:NTAP) has witnessed a decline in interest from the entirety of the hedge funds we track, it’s easy to see that there lies a certain “tier” of hedge funds that elected to cut their entire stakes in the third quarter. At the top of the heap, Jeffrey Talpins’s Element Capital Management dumped the biggest stake of all the hedgies watched by Insider Monkey, worth about $39.1 million in stock, and Robert Bishop’s Impala Asset Management was right behind this move, as the fund said goodbye to about $28.7 million worth. These transactions are intriguing to say the least, as aggregate hedge fund interest was cut by 6 funds in the third quarter. Let’s also examine hedge fund activity in other stocks similar to NetApp Inc. (NASDAQ:NTAP). We will take a look at Pembina Pipeline Corp (NYSE:PBA), Fastenal Company (NASDAQ:FAST), Evergy, Inc. (NYSE:EVRG), and Freeport-McMoRan Inc. (NYSE:FCX). This group of stocks’ market caps are closest to NTAP’s market cap. As you can see these stocks had an average of 26.75 hedge funds with bullish positions and the average amount invested in these stocks was $967 million. That figure was $754 million in NTAP’s case. Freeport-McMoRan Inc. (NYSE:FCX) is the most popular stock in this table. On the other hand Pembina Pipeline Corp (NYSE:PBA) is the least popular one with only 14 bullish hedge fund positions. NetApp Inc. (NASDAQ:NTAP) is not the least popular stock in this group but hedge fund interest is still below average. Our calculations showed that top 15 most popular stocks among hedge funds returned 19.7% through March 15th and outperformed the S&P 500 ETF (SPY) by 6.6 percentage points. Hedge funds were also right about betting on NTAP, though not to the same extent, as the stock returned 14.8% and outperformed the market as well. Here is What Hedge Funds Think About American Airlines Group Inc (AAL) Here’s What Hedge Funds Think About ABIOMED, Inc. (ABMD) Did Hedge Funds Drop The Ball On Plains All American Pipeline, L.P. (PAA) ? Here’s What Hedge Funds Think About Total System Services, Inc. (TSS) Here’s What Hedge Funds Think About Cheniere Energy, Inc. (LNG) Did Hedge Funds Drop The Ball On Markel Corporation (MKL) ?